In vertebroplasty, bone cement is injected into fractured vertebrae to stablize the spine and relieve pain. The procedure is performed while the patient is awake but sedated, and lying facedown so the physician has access to the back. The back is numbed by a local anesthetic. At Mayo Clinic, the procedure is performed by an interventional spine neuroradiologist - a physician with special expertise in the nerves, brain and spinal cord. Through a small incision and guided by a fluoroscope, the neuroradiologist passes a hollow needle through the spinal muscles and into the fractured vertebra. X-ray cameras above, below and on the sides of the table provide guidance for needle placement. 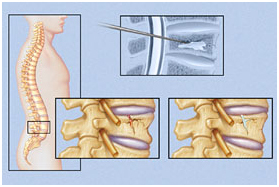 When the needle is in the correct position, bone cement is injected through the needle into the vertebra. As a rule, the procedure takes one hour for each vertebra that is treated. After the procedure, patients lie flat on their backs for two hours while the cement hardens. They are then discharged and can resume normal activity. The majority of patients have significant pain relief within a few days. Vertebroplasty is considered for patients with painful compression fractures in the spine, often caused by osteoporosis. Because the treatment often results in a dramatic decrease in pain, the advantages are numerous. Decreased pain : - A compression fracture causes sharp and debilitating pain. Those suffering from these fractures are often prescribed bed rest and pain medication. Vertebroplasty reduces and in some cases eliminates the need for pain medication, and it also restores mobility in many patients. Increased functional abilities : - The pain from a compression fracture is usually sharp and debilitating, leaving people unable to perform everyday tasks. Vertebroplasty stabilizes the fracture, decreases pain dramatically and allows a return to the previous level of activity. Prevention of further vertebral collapse : - The cement fills spaces in bones made porous by osteoporosis, strengthening the bone so that it is less likely to fracture again.